Like it or not, there are stereotypes and bantering between men and women of all cultures. Sometimes it can be quite entertaining, like in some of the sentences that my tutor taught me recently as sort of a twist to Valentine’s Day. Men say women’s moods are like the weather. however, in the next minute she can feel worse than ever. Perhaps men exhibit comparatively fewer moods, but they still have their extremes. You look like something of concern is on your mind. You seem to be very happy! It can be both good and bad that moods are able to change. This is important: Ultimately, you nevertheless have power to control your own mood. 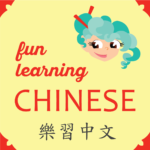 ❷ 不得了ㄅㄨˋ ㄉㄜˊ ㄌㄧㄠˇ (bù dé liǎo) is common in conversation and adds a superlative, or extreme, sense to the adjective it is describing after the initial 得 ㄉㄜ˙ (de. ), which is the grammatical indicator that an adverbial description is to follow. ❸ When learning the Chinese language, you simply have to accept the fact that common sayings like this are often abbreviated in a way that can sound truncated and ungrammatical when we try to translate it into English. 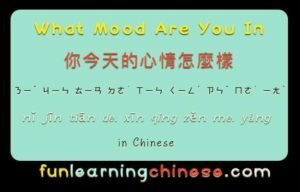 ❹ Although 麻木 ㄇㄚˊ ㄇㄨˋ (má mù) “numb” is an okay way to express this, my tutor thinks the more common way to say it is 空空的 ㄎㄨㄥ ㄎㄨㄥ ㄉㄜ˙ (kōng kōng de.) “empty, or feeling of emptiness.” This is not necessarily referring to a lack of meaning in life, unless that is specified, but rather a blankness of thought. Using the word for “numb” could be taken to imply insensitivity, as in not caring for others. Another colloquial way to express this state of mind is 發呆 ㄈㄚ ㄉㄞ (fā dāi), meaning “spaced out.” And I leave you with this sentence to translate: 我不知道我想做什麼，所以我坐著發呆。Like my FB page and look for the translation to be featured!